Making a smart trade with a coworker 25 years ago was one of the best things Tom Pinkerous has ever done. Tom was driving a dump truck for his local teamsters union hauling blacktop back in 1993 when a coworker offered him a trade: an old sealcoat machine (basically a homemade oil tank on wheels) for Tom’s extra salt spreader. When it turned out that Tom was making more money on the weekend sealcoating than he was during the week, he set upon the path that lead him to where he is now: owner of Top Quality Sealcoat and New York Stamped Asphalt. To start his company, Tom acquired a $25,000 loan and went into business with a meager fleet of equipment: one backpack blower, one weed-wacker and a new 500 sealcoat gallon from Able Industries. Skip ahead 25 years and he currently has two Seal-Right Skid mounted units (1000 and 1500 gallon) on flatbeds that are moved around by swap loader hook lift trucks, a 6500 gallon storage tank, three Graco line stripers with three Graco line drivers, two Lee Boy pavers, two wacker rollers, two tandem dump trucks and countless other equipment! While trading his extra salt spreader for the sealcoat machine was one of the best decisions Tom has made, the second best decision he’s made is to offer decorative paving to his customers. Eight years ago Tom noticed that decorative paving work started popping up on most asphalt bids and after subbing out many stamped asphalt jobs, he asked himself, why not do it myself? He was already painting tennis and sport courts at the time and enjoyed the work. “I found a used small setup for $10k on Craigslist in Buffalo, New York, and that’s how New York Stamped Asphalt started. Today, we have two SR-60 heaters, two multi-equipped 406 plate compactors, a 24-ft trailer and 16-ft box truck with lift gate to haul equipment around,” says Tom. With a mix of creative design skills, stamping expertise, and knowledge of proper technique, Tom and New York Stamped Asphalt are able to create works of art they are quite proud of. 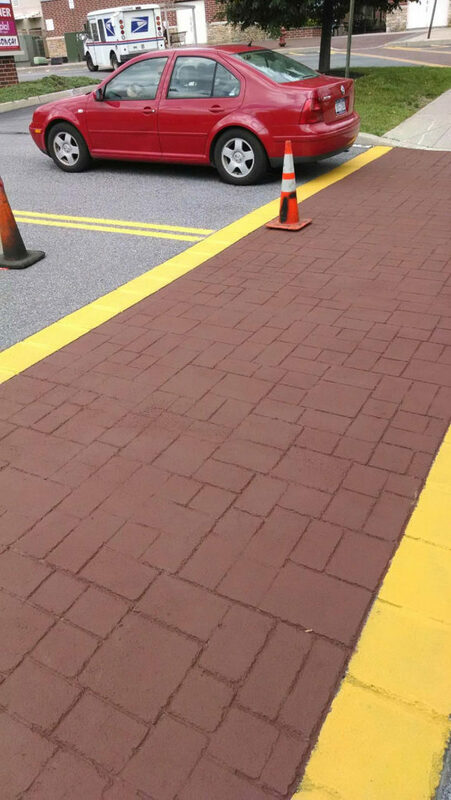 New York Stamped Asphalt uses Pattern Pavement Products and thermal products to create stamped crosswalks for municipalities, median work for DOT, walking aisles for MTA of NY and decorative work on residential driveways. 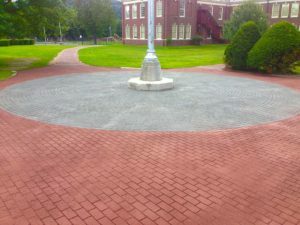 Recently they completed a very memorable repaving and stamping job in Wallkill, New York. The owners of Lippincott Manor, a banquet hall and wedding chapel, called on Tom to help them repave the inside of the banquet tent and coat it red. After two and a half weeks of work, the end result was a masterpiece. Tom and team created a plan from the owners’ vision and brought it to life. “And at the end of the day the owners were happy, so we were happy,” recalls Tom. From the days of his DIY sealcoat machine back in the 90s, Tom has come a long way and evolved his business over the years. He continues to transform his business using stepping stones along the way to pursue what he enjoys: He’s set a goal to transition to more decorative paving jobs. “Within two years I want 50% of my business to consist of decorative asphalt because I enjoy that work more than anything,” says Tom.